Will Schofield, Hall County Superintendent, Has Been On My Radar Screen For A While Now…The Heat From The Major Media Is Increasing…Can We Hear Chicken Feathers Wafting Down The Chattahoochee of Habersham and Hall? | Georgia Teachers Speak Out! ← Who’s “Scorned” The Most…Edmond Heatley or Beverly Hall? Will Schofield, Hall County Superintendent, Has Been On My Radar Screen For A While Now…The Heat From The Major Media Is Increasing…Can We Hear Chicken Feathers Wafting Down The Chattahoochee of Habersham and Hall? 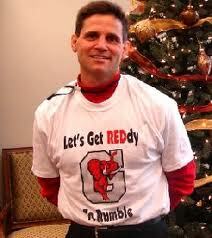 Is Hall County Superintendent Will Schofield Ready To Rumble…For Real? Just Admit The Wrong…Before Chicken Feathers Start A’ Flyin’ All Over North Georgia…Out Of The Hills Of Habersham And Down Through The Valleys Of Hall! Sidney Lanier Would Not Be Proud! There’s been lots of criticism from a few sources, one lady in particular whom I know, about Hall County rushing kids (especially minority kids) into Lanier Academy, an alternative school, so that their presence at their home schools does not hurt the chances of these schools to pass AYP. In fact, I have been sitting on one real lengthy email to Georgia Teachers Speak Out! for a number of months now. Despite what some may think, I try to operate on the mantra that “fools rush in where angels fear to tread.” I don’t like picking fights just for the sake of picking fights, but the evidence seems to be mountaining that the Hall County School System is systematically pulling kids out of high schools at the last minute, if the school officials deemed that sudden transfers would enhance the school’s chance to pass AYP. There is another damnaging article today in The Atlanta Journal-Constitution about this apparent practice in Hall County. Hey Phil Hartley (Hall County‘s school board attorney), can’t we advise Brother Will Schofield that such a practice, if it is indeed true (and it looks true to me), is unconscionable and reprehensible? Has the fear of testing and AYP made cowards of nearly all public school administrators? I hope not. Two points: I want to commend the AJC for looking into this. It has become quite fashionable in recent years to criticize the AJC (and they do get it wrong occasionally), but without a major newspaper like the AJC, these bozos in the various school systems would get by with much, much more foolishness that they currently get by with. Next point…I don’t mean to imply that Phil Hartley has not given the Hall County school superintendent and others the proper advice. But, it appears that sometimes school board members and superintendents just don’t listen to sound legal advice. But, there are other times when school board lawyers may show school board members and superintendents how to just ignore or benignly neglect the law. 2 Responses to Will Schofield, Hall County Superintendent, Has Been On My Radar Screen For A While Now…The Heat From The Major Media Is Increasing…Can We Hear Chicken Feathers Wafting Down The Chattahoochee of Habersham and Hall? Love it!!! We need a picket!! Thanks! I will ask Mr. Haynes to put Hall County on the short list for this coming school year, if things don’t change up there!